Sledge hammers are effective in accomplishing a wide range of services ranging from breaking walls and removing concrete slabs to driving bolts into concrete and stake driving. To help users to perform these activities successfully, Moglix presents an assortment of sledge hammers for sale. The hammers with wooden handles that we offer as a part of this category are drop forged from carbon steel. Their wooden handles are chemically treated as well. 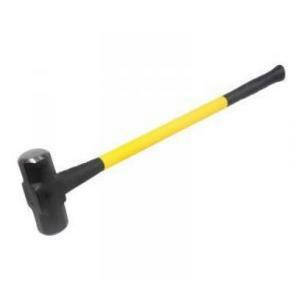 The hammers that come with fibreglass handles are suitable for use in industrial and home-based applications. They do not shrink, get loose or crack like wooden handles do.To satisfy the changing needs of customers, Moglix has sourced hammers of the best quality from some of the most trusted brands in the industry such as JCB, Ambitec, Taparia and GB Tools. We also offer plastic hammers, copper hammers, brass hammers, claw hammers, club hammers and rubber hammers as a part of this category. To acquire user-friendly, durable sledge hammers opt from the new range offered by Moglix.